Posted February 27, 2018 • filed under Experience, News. What happens when a story comes to you where you are reading? What new types of storytelling are made possible when narrative accesses technology to personalise itself to you? Breathe is a digital ghost story to be read on your phone. It tells the story of a young woman, Flo, who can communicate with the dead. As Flo attempts to make contact with her mother, Clara, who died when she was a young girl, other voices keep interrupting. The ghosts that disrupt Flo’s search for Clara recognise your surroundings and begin to haunt you, the reader, in the same way they haunt Flo. For the past two years, I’ve been participating in a research project called Ambient Literature. With colleagues from the University of the West of England, University of Birmingham, and my university, Bath Spa, we’ve been investigating the locational and technological future of the book, scoping the field of digital literature and thinking about what urban data flows and the smartphone as a reading and listening device can bring to storytelling. At the heart of this research lie questions about how literature can make use of novel technologies and social practices to create evocative experiences for readers. The funding for the project (provided by the UK’s Arts and Humanities Research Council) has allowed for three creative works to be commissioned as practice-as-research and Breathe is my response to that commission. 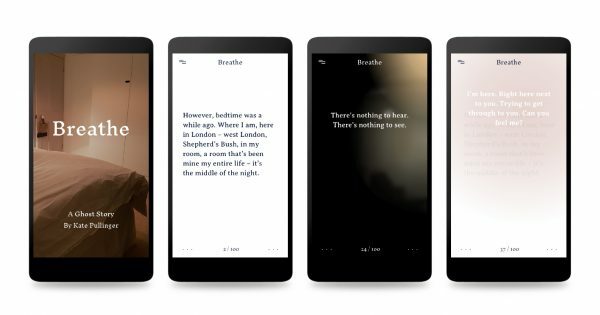 Breathe is a collaboration with the digital book space Editions at Play, which is itself a collaboration between Google Creative Labs Sydney and the London-based publisher Visual Editions. What we’ve created is a literary experience delivered using Application Programming Interfaces (APIs) and context recognition technology that responds to the presence of the reader by internalising the world around them. The story uses place, time, context and environment to situate the reader at the centre of Flo’s world as the book changes in ways that we hope are both intimate and uncanny. It’s a book that personalises itself to you. The story takes about fifteen minutes to read; it is available for free and can be read on mobile devices via www.breathe-story.com. The two other commissioned works, Duncan Speakman’s It Must Have Been Dark by Then, and James Atlee’s The Cartographer’s Confession, take diverse approaches to the challenges set by the research project; each of these works was created with a different set of collaborators. Along with the three creative pieces, the Ambient Literature project is producing a range of publications, from a how-to toolkit for writers and makers to a scholarly book co-written by the research team. As a creative writer, it’s been fascinating to work on Breathe, which builds on my own work in the field of digital fiction. 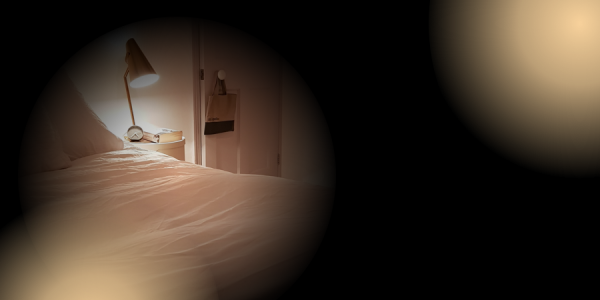 With Visual Editions and Google’s Creative Lab Sydney, I couldn’t have asked for a better team of collaborators to bring this personalised locative ghost story to life. One final note – The Ambient Literature Project is looking for participants to try out Breathe and talk with us about their experience. If you are interested, follow this link to the sign up form. Kate Pullinger is the Director of the university-wide strategy research centre, the Centre for Cultural and Creative Industries (CCCI). She is Co-Investigator on the two-year AHRC- funded research project, Ambient Literature, a collaboration with UWE, Univ of Birmingham, and the Pervasive Media Studio in Bristol. She also has a cohort of Digital Writing and Creative Writing PhD students and is Co-Editor of The Writing Platform. Pullinger writes novels, short stories, and digital fiction, including multimedia interactive collaborative works. Her most recent novel, a media-rich novel for smartphones, Jellybone, was published in autumn 2017 (Oolipo). Her novel. Landing Gear was published in 2014 (Doubleday Random House/ Touchstone Simon and Schuster); it was longlisted for Canada Reads in 2016. The novel expands and augments the story of her digital work, Flight Paths. The Mistress of Nothing won the Governor General's Award for Fiction in 2009, Canada's oldest and most prestigious literary prize; it was longlisted for both the Giller Prize and the Dublin IMPAC Award. In 2014, Kate Pullinger created a digital war memorial to mark the centenary of the beginning of World War One. 'Letter to an Unknown Soldier', co-created by theatre-maker and novelist Neil Bartlett, invited people to write a letter to the unknown soldier who stands on Platform One of Paddington Station. More than 22,000 people responded and all their letters are collected at http://www.1418now.org.uk/letter. An edited selection of the letters was published in book form the same year. Her digital fiction, Inanimate Alice, has won numerous prizes and accolades and has become a leading title in the field of digital literacy and pedagogy; Episode 6, The Last Gas Station, won Honorable Mention - The Robert Coover Award for Electronic Literature in 2016.